The AGM-65 Maverick is an air-to-surface missile (AGM) designed for close air support. It is the most widely produced precision-guided missile in the Western world, and is effective against a wide range of tactical targets, including armor, air defenses, ships, ground transportation and fuel storage facilities. 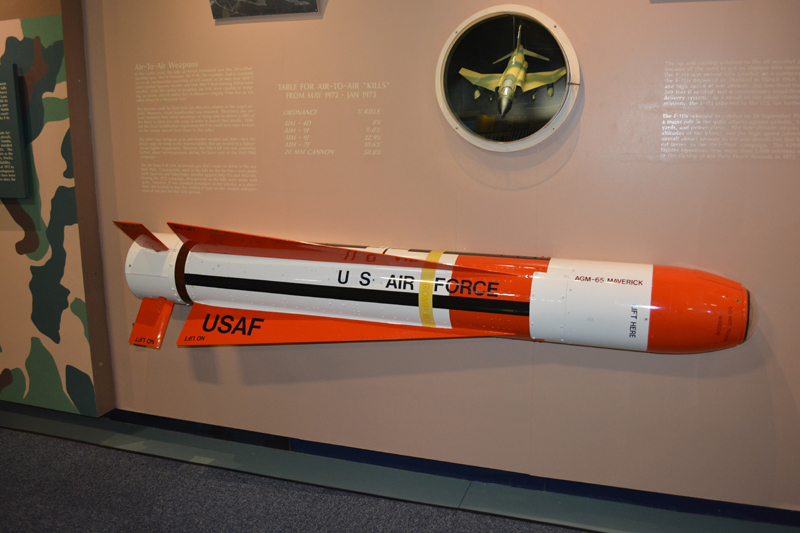 Originally designed and built by Raytheon Missile Systems, development of the AGM-65 spanned from 1966 to 1972, after which it entered service with the United States Air Force in August 1972. Since then, it has been exported to more than 30 countries and is certified on 25 aircraft. The Maverick served during the Vietnam, Yom Kippur, Iran–Iraq, and Persian Gulf Wars, along with other smaller conflicts, destroying enemy forces and installations with varying degrees of success. Since its introduction into service, numerous Maverick versions had been designed and produced, using electro-optical, laser, charge-coupled device and infra-red guidance systems. The AGM-65 has two types of warhead: one has a contact fuze in the nose, the other has a heavyweight warhead fitted with a delayed-action fuze, which penetrates the target with its kinetic energy before detonating.